If those words sound familiar, you, like me, have probably been trolling through news stories on the death of actor Philip Seymour Hoffman last night or this morning. 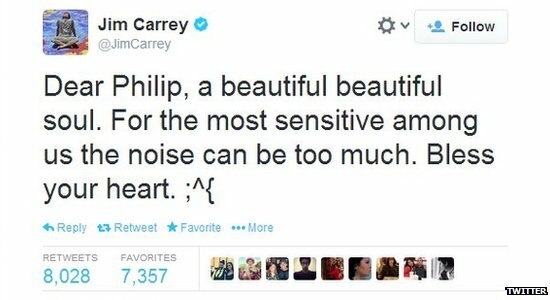 In that case, you will recognize the words as a tweet from Jim Carrey in response to the sudden, painful news. While I read account after account of the actor’s death, the police report of a needle being found in his arm, envelopes of heroine—it was Carrey’s words that stuck with me most, “For the most sensitive among us, the noise can be too much.” Other actors described the man as “humble, sweet and funny,” and “genius, brave and sweet.” He was devoted to his girlfriend, children, and acting career; he stayed, for the most part, out of the Hollywood tabloids and party scene. He was 46. He was no Lindsay Lohan or Justin Bieber. His drug use went much deeper than that. Making eggs this morning and listening to NPR, the concept for this post began to brew in my mind: it was the connection between my adoration of Hoffman, Carrey’s tweet and the soul of this man who will now be missed by many. 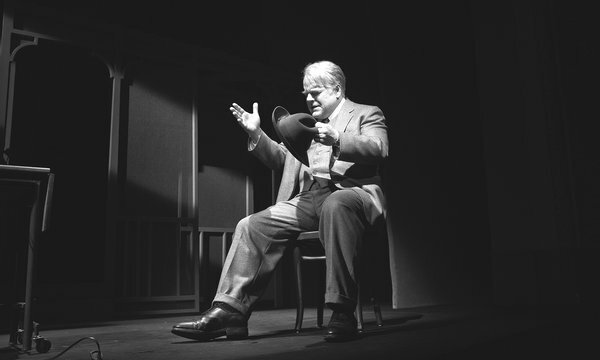 As part of a story on Hoffman during All Things Considered, the radio news anchors had pulled up an archived interview done with Hoffman in 2012 regarding his Broadway role as Willy Loman in Death of a Salesman. The character of Loman was described by NPR as “iconic and tragic,” now words that will mark the name of the Tony winning Hoffman who played him. A traveling salesman whose mental health begins to unravel with the failure of his “American Dream,” Loman was a character who brought up questions in Hoffman’s own mind about life, success and the pursuit of happiness. I cry every time I read that, and in the writing of this post, it’s been many times. These questions are not the questions of a hardened drug addict or a party-hardy Hollywood socialite. These are questions that I myself asked of life when I was most lost; these are cries from my own soul when I went looking for “what it all meant.” In my mind, these are questions of someone who is on the right road to truth and understanding because they have dared to ask them. These sound to me, like questions of someone who is in pursuit of the capital “T” truth of Jesus. I am not, in any way, trying to pretend that I know the spiritual beliefs of Hoffman before he died, the condition of his soul, or even what he would have wanted to say about his journey with God. Whatever he would have wanted is what I want to respect. However, there is something dear to be said in the fact that he posed those questions at all. Why is an Oscar-winner asking about success and happiness? Why is someone who has achieved so much of his dreams already questioning their merit? Is it, perhaps, because he felt that beyond all these things, that there was in existence something more? I’ve never been seriously suicidal (and Hoffman’s death is NOT being investigated as a suicide and is currently presumed accidental), but the only time I’ve ever considered that maybe death would be better than the life I was living was when I was at the end of my rope in terms of my soul-deep questions. I felt that I had a bottomless pit inside of me that was desperate for answers that I simply was not getting—from myself, from others, from the God that I knew. My seeking had soured from questions into doubt—that overpowering darkness that has the strength to dim the light in your heart into no light at all. Doubt will convince you that all your hope is in vain; doubt is the very extinguishing of hope. In my story, it was then that Jesus rescued me. After piecing together these pieces of words on Hoffman and from Hoffman, I very much understand why many have remembered him in their statements and tweets as “Brave.” I certainly understand why Carrey tweeted what he did. It is only the brave among us who dare to ask questions such as the ones that Hoffman asked. It is brave to set out on the road towards truth; the risk is enormous. If answered, your questions have the power to set you free. If left unanswered, the doubt has the power to take your life—figuratively, or in the cases of many, literally. It is often the most sensitive among us who are the ones who dare to take this risk–the ones who dare to dive below the noise and exhaust every avenue of life in search of meaning beyond surface level smiles and simplistic satisfaction. It is the sensitive who suffer most—the ones for which sometimes the noise is just too much. A deeply feeling soul is one that can only be satisfied by deeply given love and deeply felt answers. The only hope of this is that such a love exists. The most sensitive among us crave that which only Jesus can provide. The enemy is happy to keep an easily satisfied world satisfied easily with television, and food, and glossy magazines. It is the sensitive ones that he does not know what to do with, so he often seems to resort to much harsher means. Satan only seeks to hush the cries of those who are actually crying out. Dear ones who are struggling today for answers: your pain is felt and known. You are right to look for more in life than the manufactured American Dream sold to you by society, and family and even your friends. Your sensitivity is not weakness but your greatest asset. Your questions are not invalid—no, in fact, you are very brave. Keep asking. Keep seeking. Do not give up hope. There is good news waiting for you that is so sweetly simple yet deep enough to satisfy the most gnawing questions in the pit of your heart; his name is Jesus and he created you to be just such a being as the one that you are. He hand-carved that deep cavern in your soul with the tip of his thumb, hoping that someday, he would reside there with you always. He can light up all of your darkness. He made you to be a brave one; one of the ones who wouldn’t settle, but who would seek until you find. Don’t give up. Keep going. Don’t give up.